Find out just what the typical tuition is for U.S. undergrads throughout the nation, and how Bryant & Stratton College - Hampton measures up. Understanding the fees and tuition related to going to Bryant & Stratton College - Hampton allows you to plan economically for 4-6 years. Examine the numbers below to know how Bryant & Stratton College - Hampton's price measures up to other colleges and if you need to prepare for tuition increases. For nationwide, regional and statewide comparisons, view the table below to find out how Bryant & Stratton College - Hampton compares to other colleges. How Much Does Bryant & Stratton College - Hampton Charge for Tuition? In the 2017 - 2018 academic year, full time undergrads at Bryant & Stratton College - Hampton were billed $16,290, before corrections for financial need. $16,160 was the price of tuition. $130 was the price of fees. Unlike state schools, Bryant & Stratton College - Hampton doesn't provide reduced fees and tuition to residents of the state. Fees and tuition prices cited here don't include room and board, which can drive up your expenses. Bear in mind many students have financial aid and scholarships that decrease their total cost. For more information, click Bryant & Stratton College - Hampton Part Time Tuition & Fees. 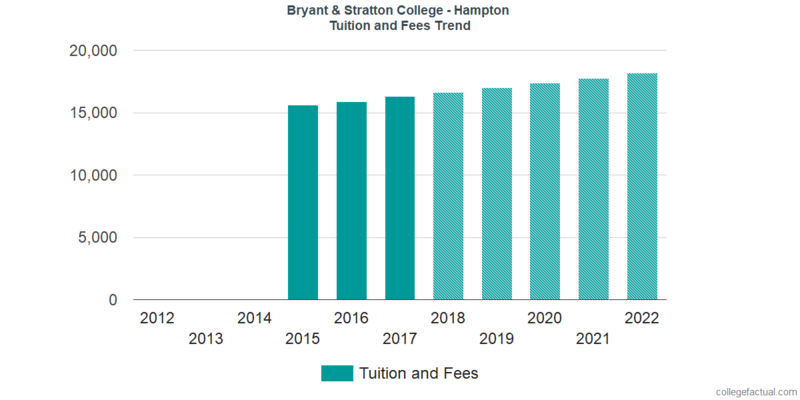 There continues to be an increase of 2.2% in Bryant & Stratton College - Hampton tuition and fees for out-of-state students in the past five years. Tuition increased by 1.9% and fees increased by 264.2%. This school year, undergrads can anticipate paying $16,650 if the growth keeps up. Because of price growth, the total expense of a four-year degree from Bryant & Stratton College - Hampton would be $68,841, and the total cost of a two-year degree would be $33,668, which doesn't include added charges such as books, transportation, and room and board. Take a look at this next chart to see how Bryant & Stratton College - Hampton tuition and fees might increase in the years to come. Mainly due to the cost of living as well as other factors, the cost of college tends to grow each year. For this reason your last year of school will be much more than your initial year.